Wager £10 get £50 bonus! As we have touched upon above already, the number of games offered at the Betvictor Casino reaches an impressive total and the majority of these are slot games. In fact, there are well over 200 slot games made available to Betvictor customers via both the company’s desktop website and mobile app. That means that the variety of different types of game offered is also impressive and encompasses both traditional style and video slots. Amongst the most interesting and popular of the slot games are the innovatively themed games, such as the Liverpool FC and Guns & Roses slots. Play slots & wager £10 for £50 in bonuses! Any punter who has never before held a Betvictor account can benefit from a new customer promotion if and when they first register with the company. That promotion provides bonus funds worth £50 when a player wagers £10after singing up for a new account. Visit betvictor.com/casino on your PC, tablet or mobile device. Click or tap the green ‘Sign Up’ button found toward the top right hand corner of the home page and a registration form will appear. Fill in the ‘Personal Details’ section of the form and select the green ‘Next Step’ button. Fill in the ‘Account Details’ section of the form and once again select ‘Next Step’. Complete registration by filling out the ‘Deposit & Bet’ section of the form, where you should also make an initial deposit worth at least £10. ‘Opt in’ to the company’s welcome bonus when prompted to do so. Wager £10 on casino games to release your £50 bonus package. Wager £10 get £50 in casino bonuses at Betvictor! A new Betvictor customer must ‘opt-in’ when prompted, in order to be eligible for the offer. You must wager £10 on casino games, excluding Baccarat and the Bloodsuckers slot machine, to trigger the £50 in bonuses. Bonus funds are split as follows: £20 slots bonus, £10 table games, £10 live casino, £10 instant win games. Wagering requirements apply to all bonuses as follows: slots bonus = 35x bonus value, table games = 60x the bonus value, live casino = 60x the bonus bonus, instant win = 35x bonus value. Only deposits made via credit card or debit card count for the promotion. Any deposits made before the customer ‘opts-in’ to the welcome bonus, invalidate the entire promotion. Customers have seven days from registering their new Betvictor account to opt-in and to make their qualifying deposit. The customer’s deposited funds are available to be withdrawn at any point without affecting the bonuses awarded in any way. Wagering requirements must be met one bonus at a time. Wagering on the Blood Suckers slot and on any Baccarat variety of game does not count towards the achievement of the bonus’ wagering requirements. 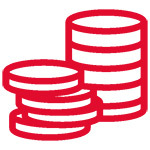 The max benefit a player can gain from any bonus is £25,000 per day. The promotion is not available to customers resident in the following countries; Armenia, Argentina, Azerbaijan, Belarus, Bosnia & Herzegovina, Bulgaria, China, Croatia, France, Georgia, Hong Kong, Hungary, India, Israel, Kazakhstan, Latvia, Lithuania, Macau, Macedonia, Malaysia, Mexico, Montenegro, Nigeria, Nepal, Poland, Portugal, Romania, Russia, Serbia, Slovakia, Slovenia, South Africa, Spain, Taiwan, Thailand or Ukraine. If your account is in Euros then the same bonus amounts apply. View the full offer terms and conditions at the Betvictor casino site. *Additional fee’s charged by your bank may apply to international bank transfers, always check with your bank before depositing. Users of devices controlled by either iOS or Android operating systems have two options when it comes to playing Betvictor Casino games on the move. Both types of device benefit from a downloadable app specific to their operating system, but can also access the Betvictor Casino via their web browsers. That second option, too, is available to users of all manner of other devices, including Blackberries and Windows Phones. The first striking feature of the Betvictor Casino mobile app is just how many different casino games are available. Well in excess of 200 games are offered to mobile customers, and these encompass all varieties and types, including live dealer options and jackpot slots. 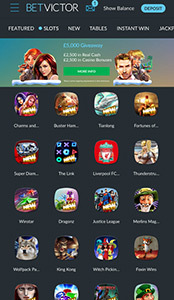 What’s more, that plethora of available games is also easy to navigate and to browse through thanks to the app’s well organised and attractive nature. In fact, an overall user friendly nature is another significant benefit provided by the Betvictor Casino mobile app. It should also be mentioned, too, that from time to time Betvictor offer mobile specific offers and promotions to make their app even more attractive to players who like to access their favourite games on the move. No apps are perfect, and whilst the Betvictor Casino mobile offering is very impressive, there are a handful of niggling issues. The fact, for instance, that the app is bundled together with Betvictor’s sports betting service means that players have to scroll through a lot of sportsbook options on the main menu before finding casino specific links. With so many games available via the app, too, some kind of search function allowing players to more quickly access their favourite could also be beneficial. Get app & wager £10 for £50 in casino bonuses! One the most important aspects of any online casino provider’s service is how well they support their customers when issues, problems or even simple questions may arise. Fortunately, in this area Betvictor cater to their punters’ needs in impressive fashion. When a query or issue first occurs, a Betvictor Casino customer can turn to the site’s dedicated online help centre for assistance. A combined area of the site that also caters for problems and questions arising with Betvictor’s sport and poker services, the help centre is populated with loads of help articles and frequently asked questions covering an array of different topics. Those topics included account queries, game specific questions, technical issues and even a casino glossary, and the entire help centre is keyword searchable. If a customer wishes to receive a more personal response to any question or query, too, Betvictor’s customer service team are contactable 24 hours a day and seven days a week. Online live chat can be activated via one simple click from the help centre and the company’s help@betvictor.com email address is also always readily available. What’s more, the company also offer the ability to request a call back from customer support staff to deal with more complex issues. To schedule such a call, all a customer need do is to click the link shown in the Betvictor help centre, select a four hour slot in which they wish to receive their call and enter some simple account information. Betvictor are one the best known and most trusted names in online gambling, and as such the company take issues of security and licensing very seriously. They provide their casino service under the company name BetVictor Limited, which has a registered office at Suite 23, Portland House, Glacis Road, Gibraltar. The company is licensed by the government of Gibraltar (licence numbers 001 and 014) and regulated by the Gibraltar Gambling Commission for services offered to customers outside of the UK. For customers within the UK, the company is licensed and regulated by the Great Britain Gambling Commission. Alongside that licensing and regulation, Betvictor are also signed up to the independent, third party regulatory service known as IBAS to offer an extra level of protection to customers. All data transfers undertaken by the Betvictor site, too, benefit from industry standard encryption. As you may expect from such a well-known and world renowned provider, the online casino service offered by Betvictor is exemplary. Whether you focus upon the desktop or mobile version of the service, it compares favourably to the vast majority of services offered by the company’s competitors. A vast array of different games can be played through the Betvictor Casino and encompasses any and all varieties that a player could desire. What’s more, Betvictor’s welcome bonus is also amongst the most generous around in offering a potential total of £200 and 200 free spins. The offer is subject to a number of requirements and limitations, but not more so than other similar offers run by different providers. Many – if not all – of the benefits available via the Betvictor Casino desktop site are also made available to mobile customers, too, as a final notable benefit of the Betvictor Casino offering. Wager £10 get £50 in bonuses!